ANN ARBOR — Esperion Therapeutics Inc. (Nasdaq: ESPR), the Ann Arbor company developing new treatments for high cholesterol, announced positive rsults from a Phase 2 clinical study of its drug candidate, bempedoic acid, in reducing the amount of LDL-C, the so-called bad cholesterol, in the blood of test subjects. Investors cheered the news, sending Esperion stock up $6.45 a share, up 9 percent, to $78.24 a share in early trading Tuesday. The test evaluated bempedoic acid added on to another drug called a BPSK9 inhibitor. The test group included 58 patients with high cholesterol. The eight-week study met its primary endpoint with additional LDL-C lowering totaling 30 percent. 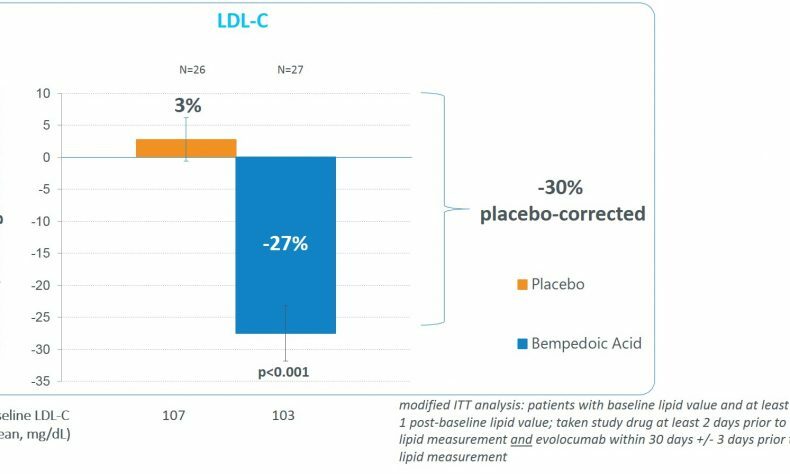 The LDL-C lowering for the bempedoic acid group was 27 percent from baseline, as compared to an increase of three percent for the placebo group. Patients treated with bempedoic acid also achieved a significantly greater reduction of 34 percent in high-sensitivity C-reactive protein (hsCRP), an important marker of the underlying inflammation associated with cardiovascular disease, compared to the placebo group which had a reduction of 2 percent. In this study, bempedoic acid was observed to be safe and well-tolerated. There were essentially no differences in the occurrence of adverse events between the bempedoic acid and placebo groups, serious adverse events or muscle-related adverse events. There were no discontinuations due to adverse events. No patients in either group had elevations in liver function tests (ALT/AST) of greater than three times the upper limit of normal, repeated and confirmed. The total number of patients now treated with bempedoic acid in completed Phase 2 and Phase 3 clinical trials is 947. Of these, six patients (0.63 percent) had elevations in liver function tests. This rate of elevations in liver function tests is consistent with the rate observed in previous clinical trials and with all other previously approved oral LDL-C-lowering therapies, including statins and ezetimibe. To listen to a replay of a conference call discussing these results, visit http://investor.esperion.com. Esperion’s mission is to deliver once-daily, oral therapies that complement existing oral drugs to provide the additional LDL-C lowering that these patients need.